Last weekend before Christmas and in other big news the world did not end today. womp.womp.womp. Two news flashes, I'm sure you wanted to read again?! I'm keeping with the High Five for Friday posts hosted by Lauren because I love them and can't resist being nosy and reading up on all of your High Fives! This week's is probably riding on the edge of obnoxious since it's entirely Christmas themed. Can't help it. It's taken over our life this week. Strange. 1// Oh, no the bad before the good photo's are still rolling in. Here's the most unexpected of Santa pictures and definite proof of our healthy holidays. After waiting way too long 3 hours at Bass Pro Shop we surrendered the idea of seeing Santa that day. Our only other option to see Santa was one weeknight after the gym, Lucas rushing to meet us from work. Now, Landon was not at all in agreement with being dropped off on some velour infused strange man's lap so we gained yet another funny, one of a kind Christmas photo. 2// spreading cheer via USPS! You know the "gift hunt" you enjoyed most and the box you wrapped so precisely? That's this in a box. My package of love. I send these year round to my niece and nephew and honestly, I don't know which "end" has more fun. 3// Dinner with the hubs at....the Masonic Lodge. It was a first for us. I'm not nearly educated enough on the Masonary Organization to yet form a genuine opinion but I can say the apple pie was good, so good that I had seconds. (opps!) I can also say that one song of the night resounded with me, I loved the lyric "Be still, I will fight this battle for you". 4// The debates still out on if these are pumpkin cupcakes or pumpkin muffins either way, I'll be making more of them for all of next weeks gatherings....hmmm,mmmm,good! 5// WOD time! Thanks to my Elf4Health buddy Erin...I found out about Sophie. She's an inspiration to thousands sharing daily WODS that pack results and once you get over the "I'm dieing" feeling...you feel incredible and ready for the next one. Take a moment to reflect on the big and small things that make your week more beautiful. And don't forget about our "beautiful" giveaway!!! Enter to win, just a few days left! Looks like you had a great week! I wish it felt more like Christmas :( Wahh! I'm so glad you guys finally caught up with Old Saint Nick! What a cute family picture :) Have a great weekend, girl! Hi Kristine! Look like you had a fun week! I think I am going to try your Elf 4 Health workout- I need something new to change up my workout routine. I hope you have a Merry Christmas! Your family is so adorable!! Merry Christmas to you all! Your blog is usually the first one I read each morning and always look forward to it!! You always have such insightful things to say :) AND I love the Santa picture, your family is so cute! p.s. Thanks for the kind words you wrote on my blog :)) It made my day!! LOVE the Virginia Tech t-shirt! I'm a Hokie myself! 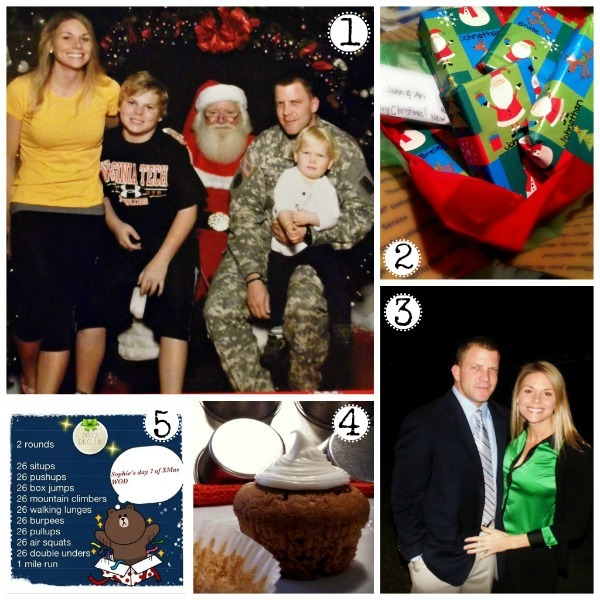 Found your blog from Lauren's link up and i'm inspired by your healthy holidays! love that pic! :) I can't believe it took 3 hours though..
whether cupcakes or muffins they looks super yummy to me!! I just did the same on your blog...and to call you gorgeous is an understatement...you look fantastic, I love your fashion posts and your fitness story is so motivating. You're proof that dedication pays off and if you want it, you can get it! Keep up the good work!!! mmmmm, they are so yummy! It's hard to only eat one! I like your thinking! Someone else told me to call them muffins then you won't feel so guilty about eating more than one! Merry Christmas to you Kaity!! Go Hokies! We're so excited for the game this week!